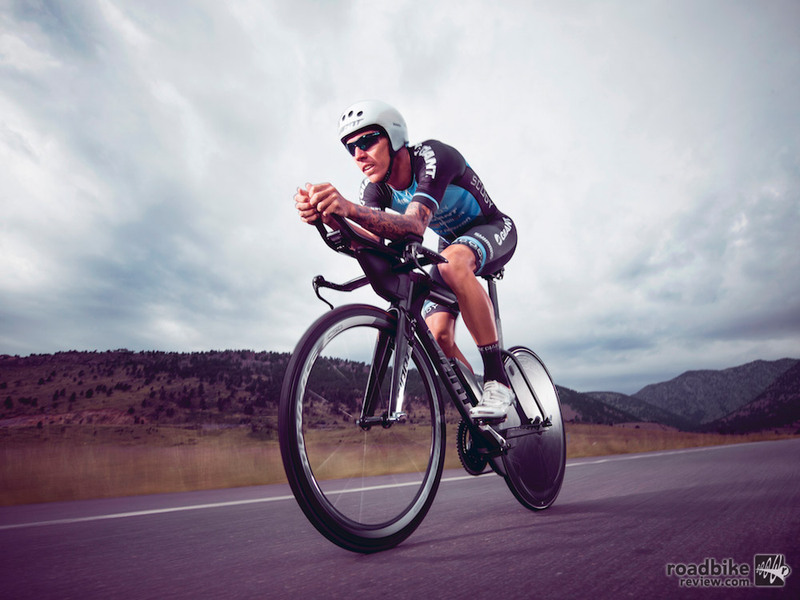 Tim Van Berkel won the Ironman 70.3 Sunshine Coast triathlon in home country of Australia while riding a prototype version of the Trinity Advanced Pro. With the Ironman World Championships in Hawaii as backdrop, Giant introduced its all-new Trinity triathlon bikes this week. 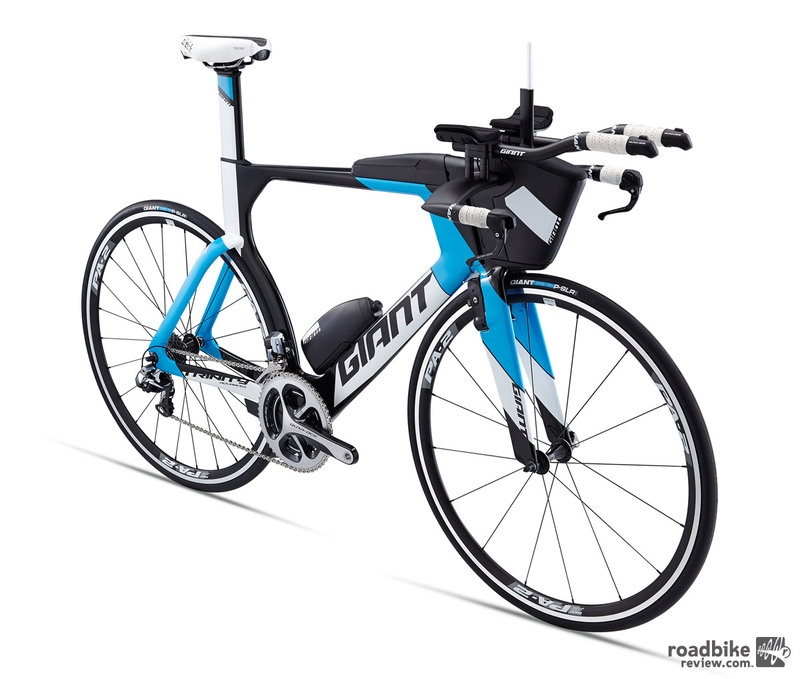 The new range of composite triathlon bikes includes two series: Trinity Advanced Pro and Trinity Advanced. A fully UCI-legal time trial version of the new bike, the Trinity Advanced Pro TT, is also being introduced as a frameset for road racers. The flagship Trinity Advanced Pro model, which is being raced at Kona by Ironman pro Tim Van Berkel, is engineered and designed for speed in real-world racing conditions. It features Giant’s AeroSystem shaping technology and a number of innovative triathlon-specific features including the AeroVault integrated hydration and storage system. Using extensive computational fluid dynamics (CFD) analysis and dynamic wind-tunnel testing, more than 250 frame configurations were developed and tested before the Trinity Advanced Pro design was finalized. 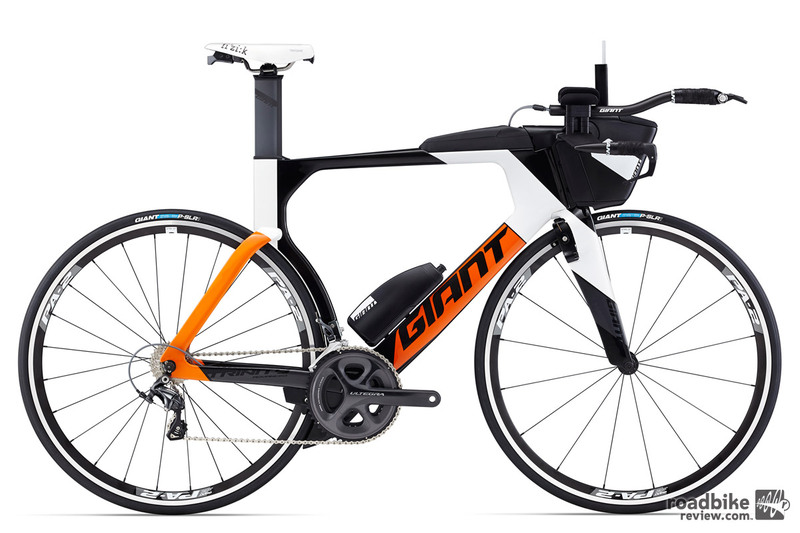 Giant worked closely with the Aero Concept Engineering facility in Magny-Cours, France, during this process. Together, ACE and Giant engineers created a dynamic mannequin with anatomically correct articulating legs to accurately measure not only pressure drag and friction drag, but also the precise aerodynamic interaction of the rider and bike while in motion. The final version of the Trinity Advanced Pro was tested alongside four key competitors at the wind-tunnel. Going against the Cervélo P5, Scott Plasma 5, Trek Speed Concept and Specialized Shiv, all outfitted with hydration and storage systems, the Trinity proved to be the most aerodynamic as a complete race-ready unit. Beyond the AeroSystem shaping technology, a design process that analyzes the distinct airflow conditions of each area in the frame and fork to minimize drag and control airflow of the entire system across all relevant yaw angles, Giant also designed a number of triathlon-specific features into the bike. The AeroDrive Tri fork is engineered with Advanced-grade composite material and a triathlon-specific 5:1 airfoil shape. Combined with an integrated stem design, this system improves aerodynamic performance while maintaining steering precision. A key component of the rider cockpit is the new AeroDrive tri base bar. This composite bar features a 5:1 airfoil shape and has a reversible design that offers 40mm of height adjustment. The SpeedControl brakes are also designed for triathlon, with both front and rear units integrated and hidden from the wind. The front brake is designed to match the profile and trailing edge of the fork, and the rear features an innovative fairing that saves 3 watts of drag at 50kph. The AeroVault hydration and storage system lets triathletes carry up to 1140 milliliters of liquid that’s accessible while racing. The toptube storage area is integrated into the toptube. The entire system is claimed to improve aerodynamic performance of the bike. One of the most distinctive elements of the Trinity Advanced Pro design is its integrated AeroVault system, which gives triathletes access to hydration, nutrition and race essentials such as tools and spare tubes. The AeroVault’s front hydration unit provides up to 700 milliliters of volume, depending on frame size, with an easy-access port on top. Additional hydration comes with the AeroVault downtube bottle, a 440-milliliter unit that’s hidden from the wind by the frame’s downtube. The AeroVault storage box is integrated into the top tube behind the stem. It provides 290 milliliters of storage for on-bike nutrition or spare items. Its shape improves aero performance and maximizes standover height, a weakness with some aftermarket storage options. The soft cover allows access from either side of the box and prevents water and sweat from getting inside. It can also house the junction box for Shimano Di2 models, allowing easy adjustments and battery charging. 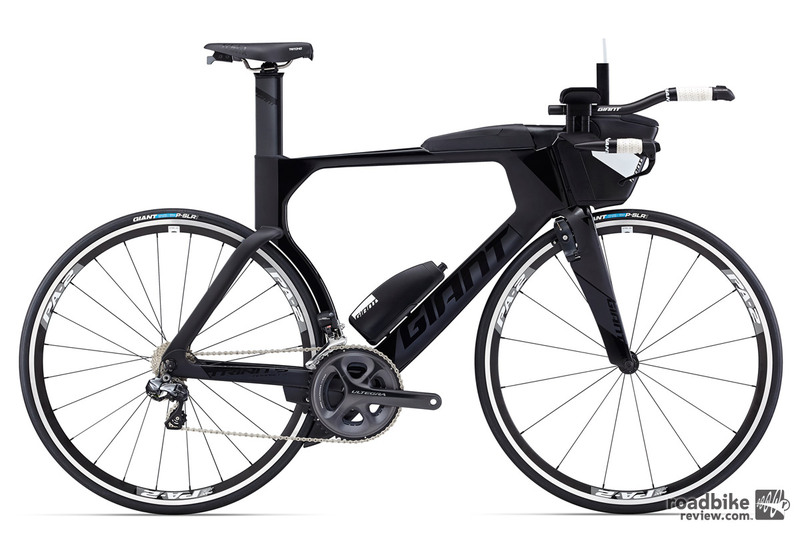 Giant engineers went to great lengths to improve the Trinity’s geometry and adjustability for triathletes. The frameset is now offered in four frame sizes instead of three. The AeroDrive base bar, arm rests and extensions all feature a wide range of quick and easy adjustments. 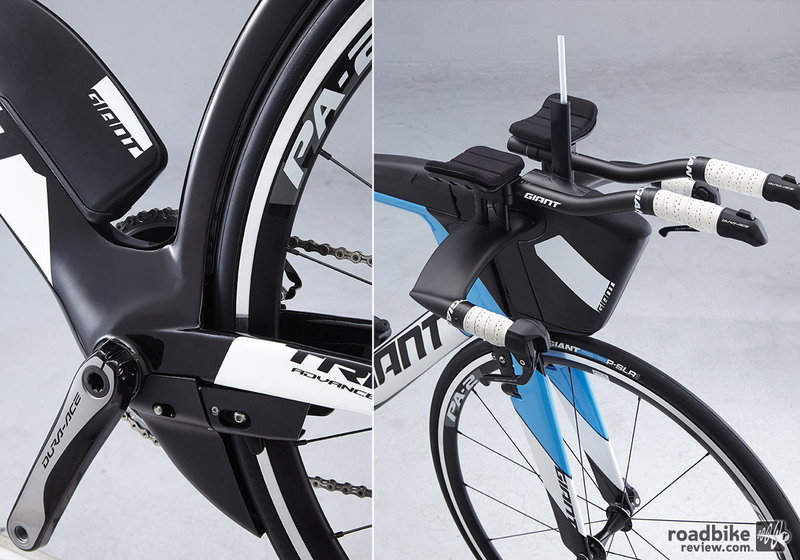 The 2016 Trinity triathlon range features two options: the Trinity Advanced Pro, which comes stock with the AeroVault system, AeroDrive Tri components and integrated rear brake fairing; and the Trinity Advanced, which features the same Advanced-grade composite frame but without the integrated AeroVault system, rear brake fairing and AeroDrive fork, stem and base bar. For road racers, the Trinity Advanced Pro TT frameset features the same Advanced-grade composite frame along with a special AeroDrive TT Advanced-grade fork, stem and handlebar that’s UCI legal for time trial competition. 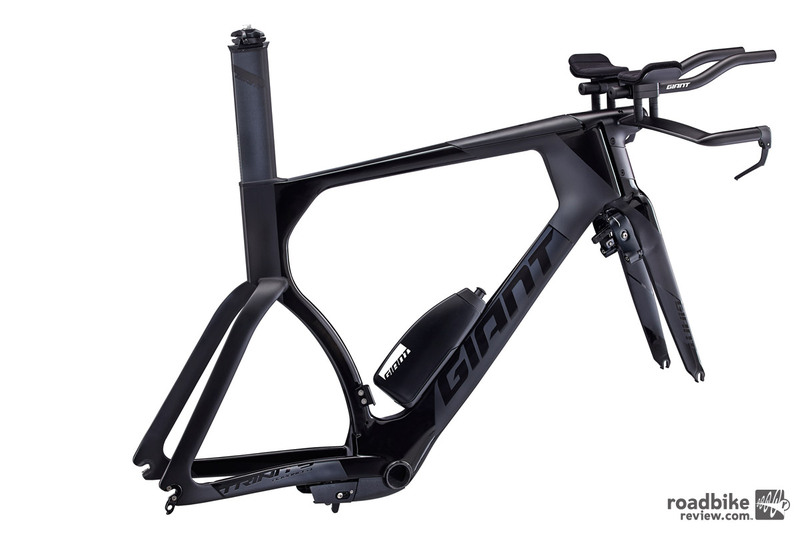 The TT frameset was developed and tested with pro riders from Team Giant-Alpecin. Pre-production versions of the frame have already been ridden to victories at major pro races including Tom Dumoulin’s stage win at last summer’s Vuelta a España. 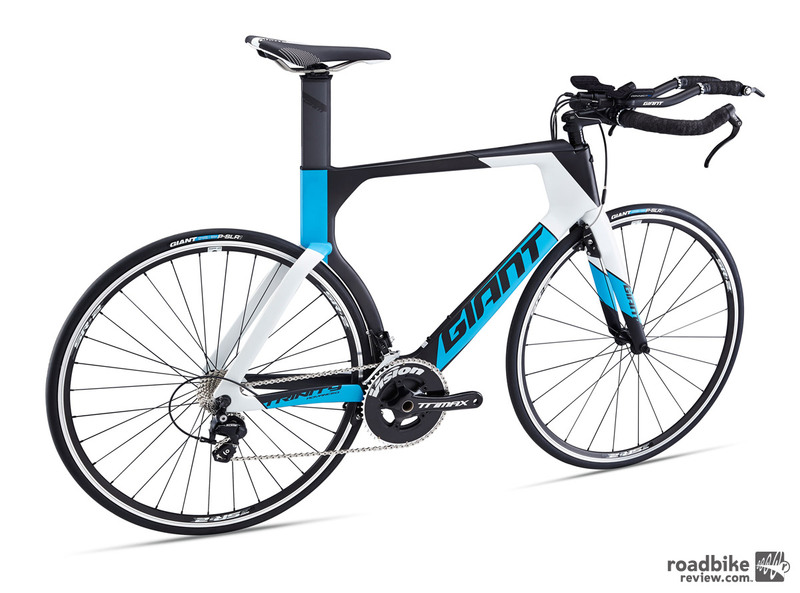 The range of new Giant Trinity triathlon and TT bikes will be available in select markets through Giant retailers starting in November. The flagship Trinity Advanced Pro 0 features AeroSystem shaping technology, along with a Shimano Dura-Ace Di2 electronic drivetrain. The Trinity Advanced Pro 1 is built on an Advanced-grade composite frameset with triathlon-specific geometry and fit and offers integrated features including the AeroVault hydration and storage system. With its Advanced-grade composite frameset and triathlon-specific features including the AeroVault hydration and storage system, downtube water bottle and integrated rear brake fairing, the Trinity Advanced Pro 2 is an attainable race-ready bike for triathletes of all levels. The Trinity Advanced model offers the same Advanced-grade frame as the Advanced Pro series but without the AeroVault System, rear brake fairing and AeroDrive fork, stem and base bar. The Trinity is also available in a time trial configuration (frameset only). Team Giant-Alpecin pro Tom Dumoulin rode a pre-production version of the Trinity Advanced Pro TT frame to one of the biggest wins of his career at the Vuelta a España in September. The AeroVault hydration and storage system lets triathletes carry up to 1140 milliliters of liquid that’s easily accessible while racing. The toptube storage area is integrated into the toptube. The entire system is claimed to actually improves the aerodynamic performance of the bike.